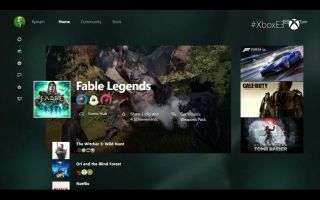 Microsoft's Phil Spencer teased a new Xbox One user experience on stage at E3 today, and now it appears the first images of the upgraded UI have appeared online. Offering a significantly cleaner and simpler interface that the current Xbox One dashboard, the new UI is seemingly built for faster access to social aspects of the device. One click access to sharing and achievements is supplemented by accessing a quick menu of useful features like settings, notifications and your friends lists by double tapping the Xbox button. Also getting a significant upgrade is Cortana, who will be able to take contextual voice commands via your Kinect, although you'll probably have to dust it off and plug it in first. Cortana will be able to start a party and invite friends from a single command, or record your gameplay and share it effortlessly. The new interface is promised to arrive "very soon", so hopefully we'll see it around the same time as Windows 10 arrives next month.